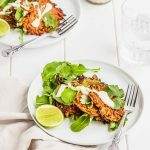 These fragrant gluten free sweet potato fritters are perfect for breakfast, lunch or dinner. Top with a generous dollop of dairy free lime cashew cream and a side salad and dinner is sorted! Drain the soaking liquid from the cashews and place in a high-speed blender with the water, lime zest, juice and salt. Blend until smooth and creamy. Decant into a small jar or bottle and refrigerate until ready to serve. Use a food processor or hand grater to grate the sweet potato. Place in a large bowl along with the ginger, cumin, coriander and salt. Remove the stem from the kaffir lime leaves and chop finely. Add to the sweet potato mixture. Lightly beat the eggs and add to the sweet potato mixture along with the buckwheat flour and mix until well combined. Heat a large saucepan over a medium heat, add the oil, and add spoonfuls of the mixture. Press down with a spatula and fry until the edges start to turn golden, around 3 minutes. Flip and fry until golden on the other side. Drain on paper towel. Serve with your favourite salad leaves and a drizzle of the lime cashew cream.